Don’t get caught slippin’, fest like a pro and use alternative transportation! We’re encouraging everyone to bus, bike, shuttle, hike, walk, carpool, pedicab, or cab to Auditorium Shores..
– DO NOT PARK IN THE BOULDIN CREEK NEIGHBORHOOD UNLESS YOU LIKE BEING TOWED. – DO NOT PARK AT PALMER EVENTS CENTER OR THE LONG CENTER. There is little to no parking South of the river around the fest and the parking garages that are close are being used by Palmer Center and Long Center’s events that weekend, so they WILL NOT be available. Closest parking will be NORTH of LADY BIRD LAKE at the many parking garages on the map provided. It’s about a 5-10 min walk from the festival entrance across the 1st street pedestrian bridge to these garages. There will be plenty of bicycle parking on site, which we heavily encourage. 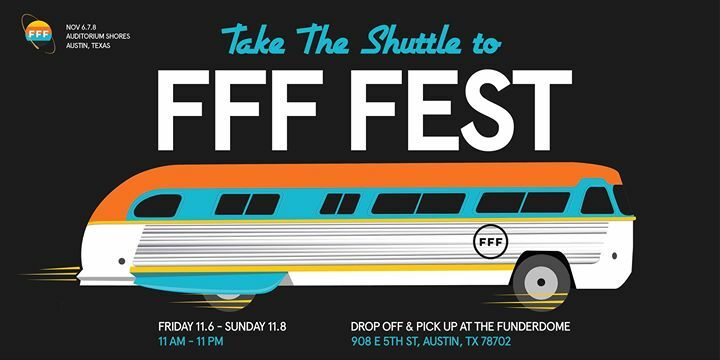 If you can not walk from your parking area, or bike, or choose not to, please consider our FFF Fest shuttle service, which will be picking up patrons at the location provided on the map below (1) Along the south side of 5th street between I 35 and San Marcos (2) All three lots between 5th and 6th east of San Marcos and west of Medina (3) On the south side of 6th half way between San Marcos and Brushy. Find more Metro Buses to the fest on capmetro.org. A bike you don’t have to pedal. Just another green option. It’s both healthy and saves the planet … Town Lake Hiking Trails map ADA parking is at 501 studios. We recommend parking there and taking the shuttle, which is also ADA compliant, friendly, and helpful. There are also Handicapped parking spaces in each of the garages that we are working with this year, and they can be found on both the website as well as the app. Get your FFF passes today at http://funfunfunfest.com. SEE YOU SOON!